Scout Publications of Harry D. Thorsen, Jr.
Publications of Harry D. Thorsen, Jr. When Harry D. Thorsen Jr., an ardent Scouter stamp collector, published a modest 32 page pamphlet "Boy Scout Stamps of the World" in 1949, little did he realize the far reaching effects this booklet would have. Publication of this work generated a great deal of interest in this topic and Thorsen soon had about a hundred corresponding 'devotees' bound together by a common interest - Scouts on stamps. The original pamphlet illustrated 35 issues of postage stamps honoring and recognizing Scouting, Scouting events or Scouting personalities and included about a hundred stamps issued in 18 countries. In November 1951, Howard Bearce invited Thorsen to join a new stamp club called "Youth Organizations on Stamps," and this invitation resulted in the organization of the "Scouts on Stamps Society" with Thorsen as president and Bearce as editor of the society's journal "S.O.S." which first appeared in April 1952. In 1955, Harry D. Thorsen, Jr. of Redson Rice Corporation published a two volume set of booklets. Volume I was a republication of his 1949 Boy Scout Stamps of The World booklet updated by Art McKinney to 52 pages. This volume was later known as the second edition of "Scouts on Stamps of the World (SOSOW)". 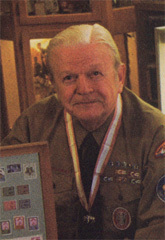 Thirty four page Volume II was entitled Boy Scout Fund Seals and Camp Post Stamps with co-author Art McKinney.